Home » Politics » HP via Punjab: Is Congress grooming Asha Kumari as Virbhadra's successor? Congress has dug its feet on Asha Kumari as Punjab in-charge. Is she poised for a bigger role? Unperturbed by the criticism for choosing a tainted Asha Kumari as the state in-charge of Punjab, the Congress party has decided to take the fight to its opponents. A day after her appointment was made official, the Congress launched an offensive against the BJP and targeted party president Amit Shah on "murder charges" against him. Despite widespread disapproval from both within and outside, the party is standing its ground and insiders claim that Congress leadership sees a "future leader" in Kumari. They say with this move the central leadership has made its intentions clear of grooming Kumari as a future leader who could possibly be a successor to incumbent 82-year-old chief minister Virbhadra Singh in Himachal Pradesh. Singh has been battling corruption charges and is under the radar of enforcement agencies. Even Congress leaders admit to the possibility of Singh facing arrest in the near future. In such a probability, the state is likely to face a leadership crisis and the grand old party would have to make a decision. Kumari's elevation could be a step in that direction. 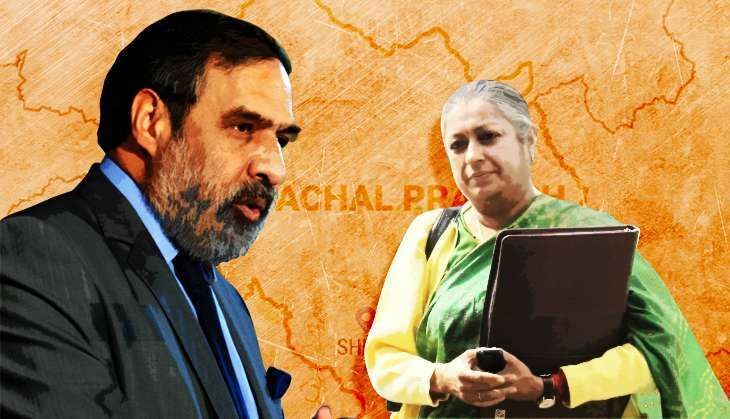 Deputy leader of the opposition in Rajya Sabha Anand Sharma was also considered as Singh's replacement, but sources claim that Sharma has given up the claim and instead would like to focus on national politics. "Sharma along with Ghulam Nabi Azad has been leading the Congress in the upper house, which has given him national prominence. It is unlikely that he would confine himself to state politics after being seen as one of the top national leaders in the party," said a Congress functionary. What works in Kumari's favour is her Thakur identity in a state dominated by the caste. Though she faces tough competition from two other stalwarts of state Congress - cabinet ministers Kaul Singh Thakur and GS Bali - the age factor could work to her advantage. If not immediate, the Congress leadership sees her as a young leader who could be given the chance to lead the party in the hill state. Also read - Why are ED and CBI hunting down Himachal CM Virbhadra Singh? Her stint as secretary too works to her advantage considering she has experience in handling state politics that are usually fraught with factionalism. And since she has the backing of the high command, she could pip others in the chief ministerial race. However, much of it would depend on her performance as the in-charge of the Punjab unit. Moreover, sources claim Kumari is backed by Sharma since they are known to be a part of the anti-Virbhadra lobby. "Despite her conviction in the land grab case, the party went ahead with her elevation and it must have been done in consultation with senior leaders. She was anyway the secretary in-charge and her conviction didn't seem to have bothered the leadership," said another Congress leader. In fact, Kumari had told The Indian Express about high command asking for her case papers before making the announcement which implies that the party was aware of the issue and the possible backlash that could follow. And still the party didn't hesitate to announce the decision which speaks about her equation with the top leadership. Even her camaraderie with top Congress leadership in Punjab is noteworthy. Sources say when her name was recommended to state Congress chief Captain Amarinder Singh, he readily agreed. Even Partap Singh Bajwa is considered to be in good terms with Kumari and had visited her in Delhi after the announcement. Interestingly, unlike Kamal Nath, who witnessed hostile reactions from Punjab for his alleged involvement in 1984 riots, attacks on Kumari seem to have died down within days of her promotion. Even Aam Aadmi Party (AAP) has not raised the issue as vociferously as it did during the Kamal Nath fiasco. Her detractors claim that AAP could raise the land grab issue in forthcoming months and could corner the Congress on this particular issue. "BJP has been keeping Arvind Kejriwal busy in Delhi and he had not been able to step up the attack on Kumari. But he wont forget, considering his politics revolves around corruption," said a Punjab leader on the request of anonymity. It seems Congress has a strategy for that as well. Sources claim since the party also has an escape plan. A day before Kumari was given the charge, a senior leader strategically claimed it to be a temporary arrangement. The idea was that if her tainted past becomes an election issue, the party could always give the charge to someone else when a long-pending organisational reshuffle takes place. Such a controversial decision may or may not backfire, but it does state that the central leadership has faith in Kumari and she is someone to watch out for in near future.